Thank you to everyone who Tweeted, Pinned, Instagrammed and Facebooked entries to be part of the 2014 S.O.A.P. Panel. We are truly surrounded by a community of talented crafters, and it was difficult to whittle more than 90 entries down to just eight panel members. 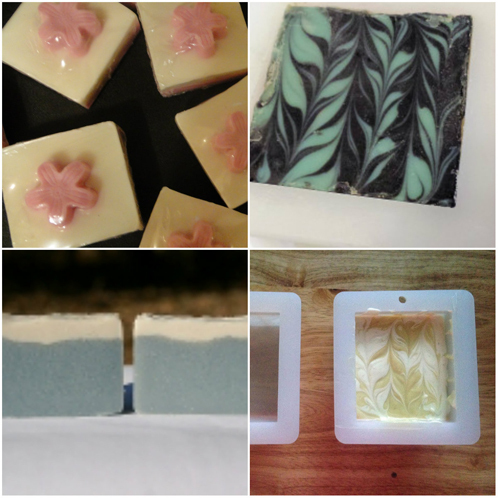 Soaps made by our S.O.A.P. Panel members! From top left clockwise: Jenny of I’d Lather be Soaping, Jess of Rustic Relevance, Dana of New England Handmade Soaps and Shannon of Smellicious Soaps. Attention S.O.A.P. team: First of all, congratulations and thank you (!) to all of you! Please e-mail us at soap(at)brambleberry(dot)com with your contact and shipping information so we can get you the mystery fragrances. We will package and ship the fragrances out no later than Friday, January 24. Thanks again to everyone who made Pinterest boards, did a shout-out on Facebook or otherwise told the social media-sphere about your favorite Bramble Berry product. We had so much fun going through your entries and seeing all your favorite products. Next time you see these S.O.A.P. panel soapers, they’ll be giving their verdict on the mystery fragrances we send. Stayed tuned to see what they have to say, and happy soaping! I am new to soaping (hot process) so I’m looking for a recommendation for an immersion blender and scale and any other requirements for a beginner. If you are new to soaping and looking for quality tools, I would recommend checking out the “Soaping Hardware” category on Bramble Berry! A scale and an immersion blender are great tools for a beginner, I would recommend these! Some other tools that are important to have would be a good set of spoons and spatulas, and a temperature gun. Also, don’t forget your safety tools, like goggles and gloves! 2014 is off to such a fabulous start! I am so excited to be involved in this last testing phase for BB! eeeek! I’m so excited I can’t contain myself! I’m thinking a YouTube SOAP Panel series is to come. Thrilled and Thankful! Thanks for your support, can’t wait to share the results with you! 🙂 I am so excited to have been chosen for the S.O.A.P panel. Thank you! Congratulations to everyone that was picked. Looking forward to getting the sample fragrances and testing them. We are so happy to have you on the panel, can’t wait to hear your feedback! It’s always so fun to get honest opinions before adding fragrances to our line! Wow! I am so excited to be a part of this panel! Thank you so much for the opportunity, Bramble Berry! Oh wow, thanks so much for choosing me! I didn’t think I would get chosen since I am a newer soap maker. It has been been a very stressful couple of weeks and this is just the news I needed! Thanks so much!! congratulations SOAP panel. 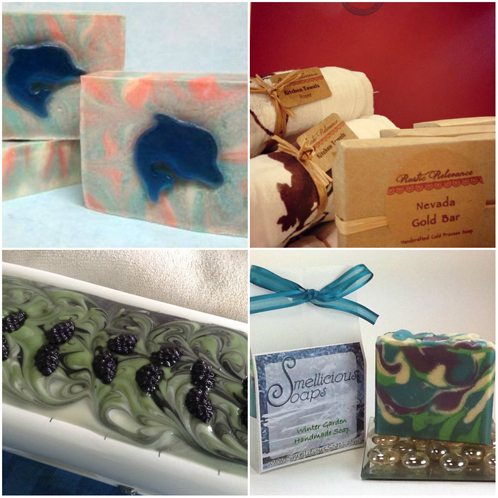 Beautiful soaps! We are excited to have you on the panel, and I’m excited to see what fragrances you all like best 🙂 It’s always so fun to get feedback from our soapers! EEEEEKKKKKK! I actually got picked! 😀 I didn’t think I would get picked since I’m a soap making newbie! Eeeeeeekkkkkkkk! I’m so excited you have no idea! Gahhhhh! Thank you Anne Marie and all the other people at BrambleBerry for bringing me both my packages and topping my day off with this great news! Congrats S.O.A.P. panel! It’s no wonder you guys were chosen, your soaps are all beautiful. Thanks for the kind words and support, we are excited to share the testing results with you all! Congrats to everyone!! Can’t wait to see and read about your soapy tests. We are so excited for our new S.O.A.P. Panel, thanks for your support :)!